We are so happy to share this wedding today. Lindsay and Paul were married on a beautiful June day in Nantucket. Our bride Lindsay had a pretty clear idea of what she wanted from the onset and worked closely with my team pulling all the little details together. 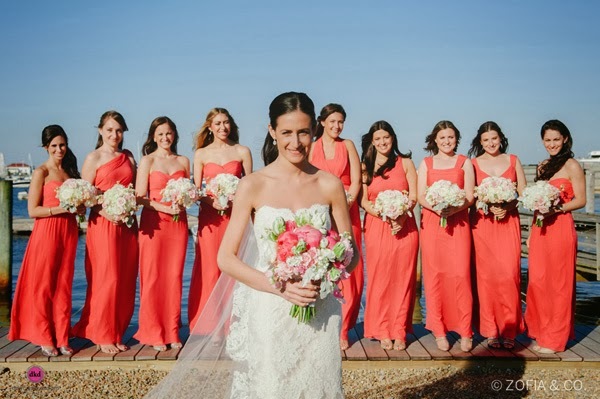 Coral and white were the main colors with pops of pink and silvery greens. Driftwood played a big role in our tablescapes and created such a unique look. I think one of the best moments of this day for me was peeking through the draping to see if we could start dismantling it before the guests came in for the reception. Standing right in front of me was our beautiful bride and her parents. To see the emotion on their faces in seeing all the planning and hard work come to life was so emotional. Dad even made me cry! I love when we really get to know the families that we work with. It makes what we do even more important and it's heartwarming when I see that much love in a room. Lindsay had a surprise of her own for the Paul. During the ceremony she had the acapella group The Cobbletones flash mob the ceremony and break out in to song. The pictures of Paul's reaction are priceless! For more of their special day head on over to Style Me Pretty and get all the scoop on the big day from Lindsay herself.